This page is dedicated to those people who sponsor our pal, Gypsy Boots! Thanks to YOU Gypsy is able to spead his message of good nutrition, good health and a healthy lifestyle across the world. Happy NEW YEAR 2000 from Gypsy to all his fans! And a Happy Easter and Passover Season too! Gypsy says, "And a special one to WebMaster Bill (Le Fantome) , Pancake Jack, Engineer Dan! Gypsy wishes every WAKUNAGA of America employee in Mission Viejo, CA, Mark, George, Bill and High Tie, workers and the millions of KYOLIC customers the greatest and healthist Christmas and a prosperous year 2000. (Thanks for the Kyolic, guys!) Available at health stores internationally! Along with everybody at NEWBURY PARK REALTORS: Phil Daily, Vince and Rick and all the wonderful salespersons and thousands of contented customers." Gypsy will be appearing in the Annual Sonoma Jack PARADE this year in June! Thanks for your support of Gypsy and his new domaine, gypsyboots.com! That's Dave on the bumper with Gypsy! 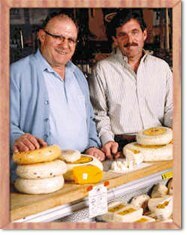 Also THANKS from Webmaster Bill to Pete & David Viviani from SonomaJack for the Cheese fellas! To visit their website clic on their picture! Here are sponsors of Gypsy's 90th Birthday Party! Gypsy is a friend of the National Tree-of Life who make great health products owned by Jim Harper.. Gypsy goes wild over Pamela's Cookies! A healthful snack found in Health Food Stores nationwide! When in Corona CA please visit GLEN IVY HOT SPRINGS SPA or call 1-800-454-8772 for info. They have wonderful hot springs spas, saunas, mud baths,massage rooms, steam rooms all to make the younger you. Along with healthy foods and treatment. Recommended very highly by Gypsy. NAKED JUICE COMPANY...PURE AND FRESH...Bob, Leo, and Tim of the fantastic OMEGA JUICER Model 1800! LOUISE OF BIRKENSTOCK is another great sponsor along with the TAPIA BROTHERS CORN STAND who have the sweetest corn and melons from Felix, Betty and Tommy! Gypsy reccommend KASHI and especially their great tasting energy cerald! Healthiest and Tastiest Birthday Cakes in the world come from CLASSIC CARROT CAFE in Ventura! Great organic salads come from FLORA BELLA FARMS! When in Northern California please stop by Charlie Olson's SunnyVale food stand! Great organic fruits and cherries, veggies! PINES WHEAT GRASS Gypsy loves his greens from this place! FOLLOW YOUR HEART HEALTH FOODS & RESTRAURANT in Canoga Park have the greatest tasty soup and crackers! Nature Boy Gypsy Boots Vegan Express---a new product developed for Gypsy...a veggie butter found in Hollywood. Makes great veggie burgers! And a great friend in Pia. owner of Thai deli and distributor of great energy & healthy products..call 323-851-8837.